Thank you all for your returns this season it was a tough one thats for sure! A summery can be found below but in short 81 Brown Trout where landed and 6 Salmon Par. 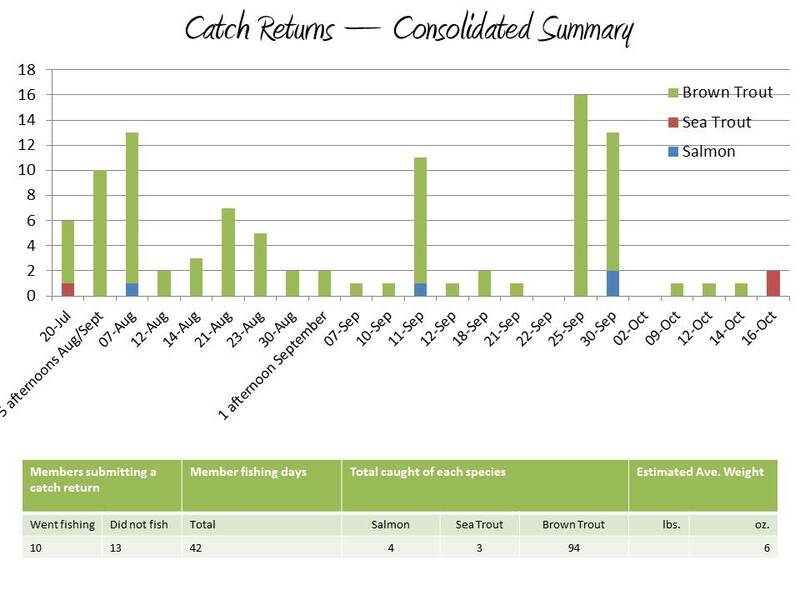 Thank you to all that provided catch returns this season, a summery can be found below but in short 356 Brown Trout where landed 8 Sea trout and 10 Salmon Par. Once again a massive thank you to all that sent us your returns we received 15 and this amounted to 317 fish in Total consisting of 286 Brown trout 28 Salmon par and 3 Sea trout. A summery can be found below. Thank you to everyone who provided a catch return. 7 members reported that they had been fishing on the river, and catching an impressive 575 fish, including 538 Brown Trout, 35 Salmon Smolts, 1 Sea Trout and 1 salmon. A summary is available for download below. A big thank you to everyone who provided a catch return. All in all, 6 members reported that they had been fishing, and catching 286 fish, including 252 Brown Trout 30 Salmon Smolts and 4 Sea Trout. A summary is available for download below. A big thank you to everyone who provided a catch return. Despite the fact that we only started to welcome members towards the end of 2011, it seems that a small number of you were able to take advantage of the offer of free fishing for the latter part of the season, which is great news! All in all, 10 members reported that they had been fishing, clocking up 42 fishing days* and catching 101 fish, including 4 salmon smolts and 3 sea trout. A summary is available (see right), or you can download the full consolidated catch return document below. Why submit a catch return? As a condition of our lease, all members and/or guests of members are required to provide a 'log' of fish that have been caught on the river during any one season - also known as a 'catch return'**. When should I submit a catch return for 2019 Season? We need to provide a consolidated catch return to the land management company by 31st December and therefore require that our members submit a catch return to us no later than 30th November. How are the details I provide used? 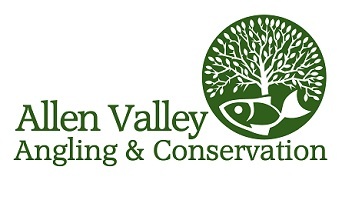 Details provided in the catch return will be used alongside other data to help monitor fish populations and we will also use the information gathered to provide all our anglers with useful insights and tips for getting the most out of their fishing trips to the River East Allen. No personal information will be revealed (unless the member gives their assent of course, like members Lucy, Darren and Carolyn, who all got in touch to share news of their catches). So please do remember to keep a log each time you fish. Even if you do not actually manage to get to the river this season, or indeed if you do, but the fish prove too wiley, please get in touch to let us know. Many thanks to all our valued members! *A 'fishing day' as reported here refers to a single day session of any duration - it may be a full day, half day or just an hour or two. **Catch Returns for AVAC are required in addition to any catch return that members may already be compiling for the enviornment agency as a condition of holding a migratory fishing licence. All those who submitted a Catch Return were entered in to prize draw for a chance to win a cheque to cover the cost of an Environment Agency, Non Migratory Trout & Coarse Rod Licence for the 2018 season. The winner was drawn at our AGM. Click here for more details about the AGM. Don't forget to download and complete the catch return form for the 2019 season! Please feel free to use the Example of a catch return below, just edit it to fit your return, then email it to the above address. 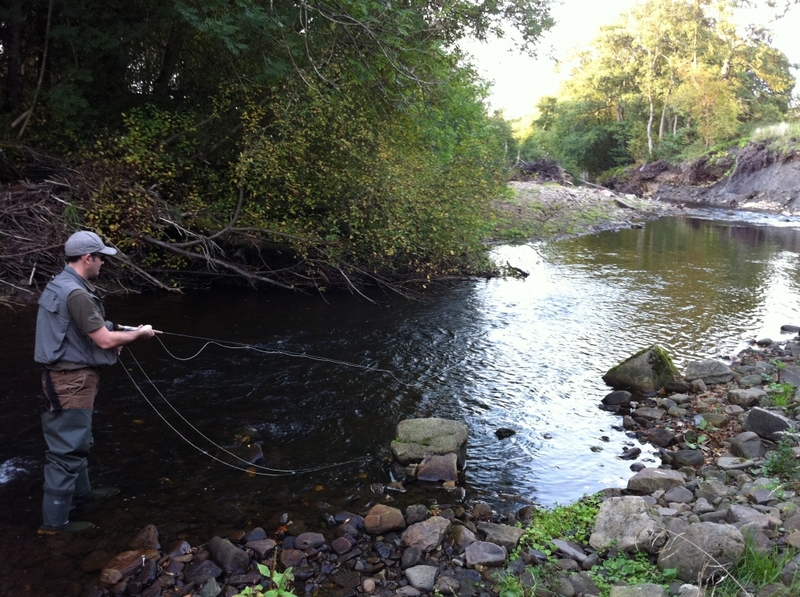 We would also really love to see your pictures and hear your personal stories on the river - alongside the homepage of our website, the most popular page is the fishing reports page, so we know that it's not just us that love to read these personal and often helpful accounts of fishing on the river. Pictured: Mark Stangroom from Leeds - fishing on the last day of the trout season as a guest of Chairman Graeme Edwards and Sarah Kemp. Unfortunately, Mark won't be providing a catch return - better luck next year Mark!